Last month we brought you synthetic cadavers. Now we bring you the newest invention: Alberta, the synthetic cadaver dog. No more euthanizing canines! SynDaver's most recent invention: Synthetic Canine Cadavers. No more euthanizing dogs for Veterinarian Studies! TAMPA, Fla. (AP) — Alberta the dog doesn't bark or bite, and she's skinless and hairless, although she does bleed. Frankly, she is frightening to look at. But she apparently makes an excellent cadaver. Alberta is a canine made entirely of synthetic material, created to provide veterinary students with anatomically correct bodies for surgical practice. And while she looks like she belongs in a Halloween horror display, all bulging eyes and bared teeth, this product is designed to replace the euthanized shelter animals many vets practice on. 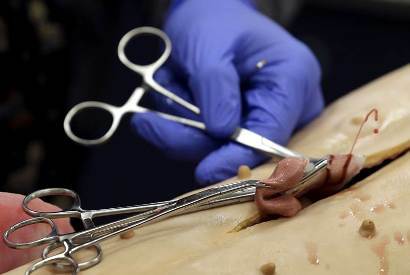 "Animal cadavers are bad, not just because they were once live animals but because once the tissues are frozen and or preserved, they're not the same anymore, so they don't feel the same and they don't perform the same," said Dr. Christopher Sakezles, the founder of SynDaver Labs. "This product is going to give them more of a lifelike experience with the tissue," he said. SynDaver also manufactures synthetic human cadavers from the same material, tweaking synthetic polymers made from water, salt, fiber and other compounds to simulate all sorts of actual tissues, from fat and muscle to organs, veins, skin and bone. On Tuesday, the company unveiled its newest product, the synthetic canine. And its employees are already working to fill their first order: 25 dogs for the University of Florida's College of Veterinary Medicine. Sakezles persuaded one of the stars of the TV show Shark Tank to give him $3 million in exchange for 25 percent of the company last year. That deal fell through, but executives told Science magazine they later raised $10 million, and now the company is seeking $24 million in a crowdfunding campaign. SynDaver's cadavers, both human and canine, are created with functioning bodily systems, complete with a heartbeat, a circulatory system, lungs that inflate and flesh that bleeds when cut. The skin is creepily chilly and the rubbery organs are clammy to the touch. They can be customized with pathologies, illnesses and complications. During Tuesday's news conference, Dr. David Danielson sliced into Alberta's intestine and found two marbles. Another cadaver "ate" a sock. 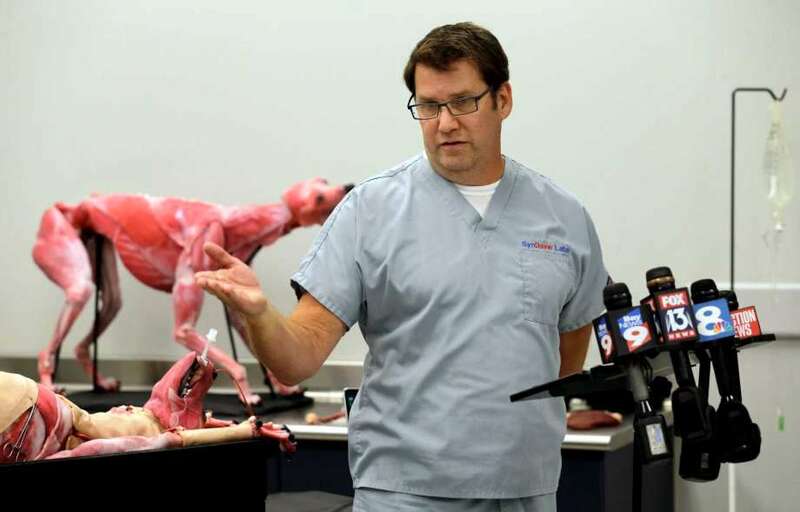 "It allows the students to experience real-life problems," said Daniels, a Tampa veterinarian who works for Syndaver. "The goal would be to experience them without having the animal die." Dr. Tom Vickroy, executive associate dean at the UF College of Veterinary Medicine, said the school "will be providing expertise that will help refine and enhance the utility of synthetic tissues, organs and full-scale canine models." These cadavers are not cheap: the synthetic humans sell for $40,000 apiece, the synthetic dogs for $28,000. But each cadaver can be operated on some 35-40 times, with pieces replaced as needed to simulate different ailments. SynDaver sells each cadaver with a service contract, so the cut-up bodies are repaired over and over. "It's a 3D jigsaw puzzle," said Sakezles. "You can swap pieces in and out." If these synthetic dogs prove profitable, the company already plans its next product line: a cat.